I love bacon. Maybe you do too, seeing as it’s a heavenly product descended from the gods of yore or ancient Greece or something, probably. But do any of us love it enough to slap it all over our respective body parts and then shave it off with a razor? The folks behind Baconnaise and the Bacon Coffin are trying to outdo themselves yet again, this time with Bacon Shaving Cream. We keep wondering what Justin and Dave of J&D are going to do next, bacon-wise, and they always end up surprising us. Bacon Salt? That’s a given. Even Baconnaise makes sense, as you can skip a step in a BLT or just add more bacony goodness. But now we’ve got to wonder if people will be able to concentrate on shaving when there’s a porky scent wafting through the air. If you want to jump on the Bacon Shaving Cream train you’ll have to act fast — there’s only 2,500 jars of the stuff going for $14.99 each, reports WPTV.com. 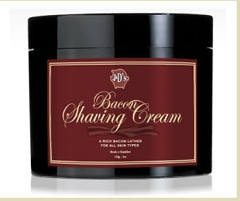 J&D’s Bacon Shaving Cream is a high end, luxurious bacon-scented shaving cream for all skin types. It is best used after a hot shower or before an important date with someone you may want to spend the rest of your life with. For the record, I just ordered the stuff just so I can let you all know how it goes. But I won’t tell that important date beforehand. It should be a fun surprise! If I get a marriage proposal by the end of the night I will become a committed fan. If anyone else gets their hands on this stuff, let us know how it works out on faces/legs/other limbs by sending an email to tips@consumerist.com.